The first British rugby player given a four-year ban for taking steroids says doping in the sport is widespread. Daniel Spencer-Tonks, a former England Under-16 rugby union player, tested positive for the steroid stanozolol in an out-of-competition test in February. 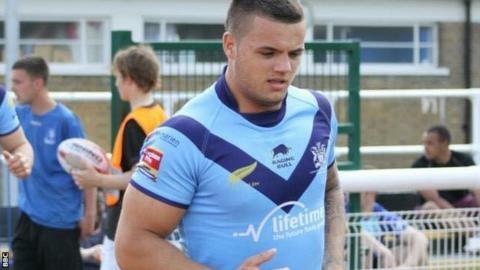 He was playing for the University of Gloucestershire All Golds in rugby league's third tier at the time. "It is hugely widespread through all levels of rugby - loads of people are on it," the 20-year-old told the BBC. Rugby Football League chief operations officer Ralph Rimmer said its "comprehensive testing system" had carried out 507 tests this season to try to catch the "small percentage" of cheats. Spencer-Tonks told BBC Radio 5 live Investigates: "More people are taking it at the lower level because obviously there is testing at the higher level and there is more support and gym work." He claimed to have spoken to some former Premiership rugby union players who said it was a problem at the higher level too. Spencer-Tonks said: "I've spoken to ex-professional players and people who represented their country at senior level and they have said they knew people on their team who were on it. "They have all said it is massive at the higher levels and I was one of the unlucky ones who got caught." Both codes rely heavily on intelligence-led testing and no player has tested positive in top-flight rugby union for more than four years. Rugby league tests at professional level and there is mandatory testing in rugby union at senior levels, but players can be tested at all levels. "There is another theory to explain how the game got bigger, faster and stronger. Put simply - and it is a simple idea - rugby union got on the gear." Spencer-Tonks said he used the steroid for body-image reasons rather than to improve his performance. He said: "I just wanted to look good, lose a bit of weight, have a better body really. "I know it was stupid but I was young and naive and just took it." He said he took the drug while he was playing abroad, before returning to the UK. "There is a lot of pressure on players to be bigger, faster and stronger as they are the players who get picked," he said. "I wouldn't say it was coaches saying you should take something, more the fact the players want to be the best at their sport." Since UK Anti-Doping (Ukad) was set up six years ago, 63 players and coaches from rugby union and league have been banned, the vast majority from the lower tiers in both codes. Ukad has carried out more than 40,000 tests, about a quarter of which were in rugby. It boasts a 50% success rate when using intelligence-based testing. Players in Northern Ireland, who are governed by the Irish Rugby Football Union (IRFU), are tested under a system run by the Irish Sports Council. "It's had a harsh effect on me and my family. I would definitely say, 'don't take it'," said Spencer-Tonks, who is banned from all sport until 2019. "It can mess your body up, your mind up, and can have harsher effects than just ruining your rugby career." Spencer-Tonks was the second person in the UK to receive a mandatory four-year ban under new World Anti-Doping Agency (Wada) rules brought in this year. The first was 26-year-old Welsh weightlifter Andrew Riddiford, who tested positive for steroids in an in-competition test at the Welsh Senior Championship. "The new tougher sanctions ensure that those who consciously choose to cheat, and ultimately keep clean players from their rightful place in the team, will be removed from sport for a longer period of time," said a Ukad spokesperson. "I hope this will act as a greater deterrent to those who are considering cheating in the future." Stephen Watkins, the Rugby Football Union's anti-doping illicit drugs programme manager, said: "The messaging across the board on body size and playing rugby is that it's all about skills first and foremost. "The RFU does more testing that any other rugby nation, and education around doping is delivered to players from a wide range of ages and levels, including England squads, professional clubs, regional academies, schools and other education providers. "At the elite end of our game, our testing programme underlines that there is not a culture of systematic doping but we are not complacent." Rimmer, meanwhile, said: "The RFL works closely with Ukad, which in turn ensures that all of its tests are deployed effectively, using a combination of intelligence-led and random testing. "We have a comprehensive testing system in place, having conducted 507 tests already this season, and work hard to ensure players and staff are also provided with the necessary education they need to avoid taking prohibited substances. "The RFL takes the issue incredibly seriously and will continue to work with Ukad to ensure the small percentage of those who choose to cheat in our sport are caught and dealt with accordingly." Does rugby union have a drugs issue? Read more on Rugby World Cup 2015: Bigger, faster, stronger, dirtier?